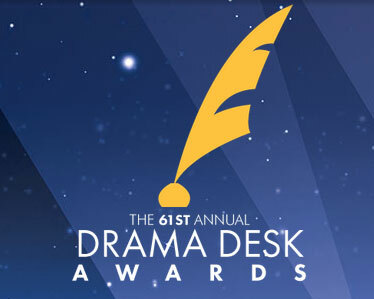 The Drama Desk Awards, given annually in a number of categories, are the only major New York City theater honors for which productions on Broadway, Off-Broadway and Off-Off Broadway compete against each other in the same category. This morning Vanessa Williams and Matthew Morrison did the honors in announcing this year's nominees. • The rapturously reviewed Roundabout Theater Company revival of “She Loves Me” received nine nominations, including best musical revival, plus acting awards for cast members including Laura Benanti, Zachary Levi and Jane Krakowski. New musical American Psycho earned eight — although not one for outstanding musical. • This year's biggest blockbuster - Hamilton - isn't here because it was considered last year during it's off-Broadway incarnation. That will make these awards less of an arbiter for the Tony Awards since they are absent here. • Also, Shuffle Along earned a total of six Drama Desk nominations. But none for previous Tony Award winners Audra McDonald, Brian Stokes Mitchell, or Billy Porter. Choreographer Savion Glover scored a nod, as did several design elements.